Seymour De Ricci’s and Henrietta Bartlett’s The Book Collector’s Guide: A Practical Handbook of British and American Bibliography (1921) is much more than a forgotten price guide. The timing of publication and bibliographic expertise provide an insider’s view of the Golden Age of American book collecting--then arguably at its peak--when opportunities were abundant and mighty collectors rose to the occasion. It was a transitory age, too, and reflects in retrospect the coming shift from old paths to new paths in collecting that would take hold in the 1930s. The story of the book’s birth is also quite a tale with the polymath bookman Seymour de Ricci at the helm and Henrietta Bartlett as his brilliant, but generally unrecognized co-author. The book itself is a stout octavo of 649 pages printed by the Torch Press of Cedar Rapids, Iowa, for the Rosenbach Company of Philadelphia in two issues: the deluxe version on Japan paper in a mustard cloth binding numbered 1-100, and 1,000 numbered copies on regular paper in a less sturdy green cloth. Copies of the deluxe issue have survived nicely over time while the trade issue is usually found with heavily acidic paper and cracked hinges. Neither came cheap upon publication. The deluxe issue price was $40 (roughly $488 in 2016 dollars) and the trade issue $10 ($122 in 2016). I have a copy of the original prospectus issued by Rosenbach and two variant promotional pamphlets from Maggs Bros., London, representing the marketing push in the UK. De Ricci writes in the preface that this book was designed to be an updated version of the fundamental bibliographic guide by William Lowndes / Henry Bohn titled The Bibliographer’s Manual published a half century before. Although The Bibliographer’s Manual is a “remarkable production” it had become “desperately antiquated” according to De Ricci. “In this new Book Collector’s Guide are described, in the alphabetical order of the authors, the two or three thousand British and American books which fashion has decided are the most desirable for the up-to-date collector. . . I have sought to list, with a certain amount of completeness, the first editions of the chief works and in many cases of all the works of the greater British and American authors from Chaucer to Swinburne . . . it incorporates the substance of all the latest monographs on each individual author and in several instances will supply the only conveniently accessible list of an author’s first editions. . .
What is not included is insightful for the time as well. Important incunabula is barely touched on—an area hotly pursued by the earlier generation of collectors. Western Americana has yet to reach De Ricci’s considerable mainstream. Nor have the great works in science and medicine been included as John Carter points out in a lengthy critique of the book in Taste and Technique in Book Collecting (1948). These collecting areas would blossom soon, partly on their own merits and partly because the oil gusher of early English literature so popular at the time was quick to run dry. No matter one’s wealth or reach, all book hunters are invariably governed by the first law of collecting: you can only gather what is available. 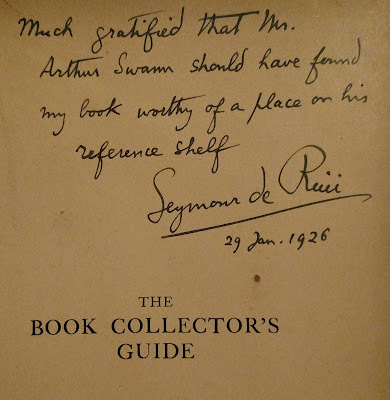 Seymour de Ricci’s easy command of such a wide range of books deserves elucidation. De Ricci (1881-1942) was born in England but lived much of his life in France. He was a renaissance man of sorts producing publications pertaining to Roman history, European art, Egyptology, French furniture and décor, bronzes, and other areas. However, as a bookman par excellence he is remembered. His bibliographic expertise pinnacled in the area of provenance research. Tracing the history of particular copies of books through the maze of private owners, auctions, and libraries over decades or centuries and across continents was sport to him. No one was better and few have equaled him at the game. This strength threads through his various major bibliographic works including A Census of Caxtons (1909), Catalogue raisonne des premieres impressions de Mayence (1445-1467) (1911), and A Census of Medieval and Renaissance Manuscripts in the United States and Canada (1940-). De Ricci’s English Collectors of Books & Manuscripts (1530-1930) and Their Marks of Ownership (1930) is a must read for those with an interest in book collecting history. 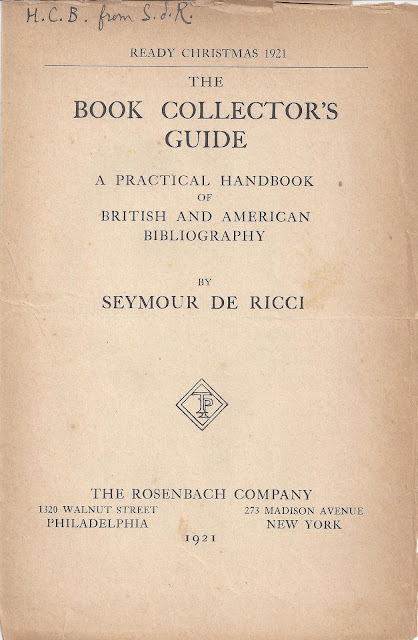 The Book Collector’s Guide also highlights his provenance skills and knowledge of biblio-history. 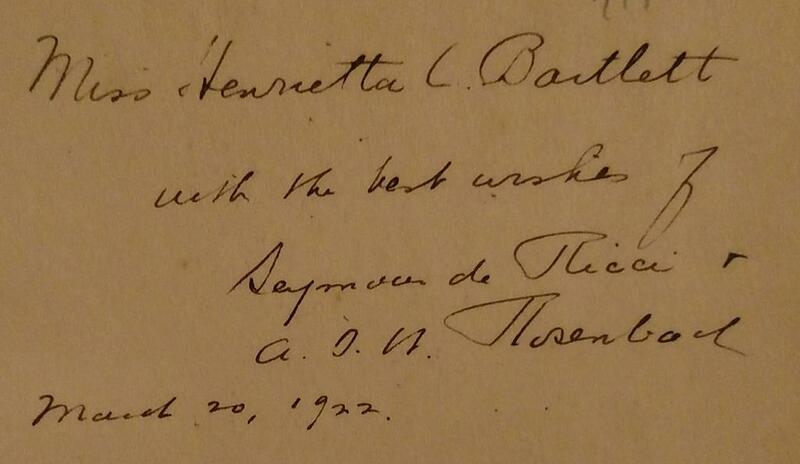 Bartlett (1873-1963) was, like De Ricci, one of the foremost bibliographers of her time. She lived most of her life in New Haven, Connecticut and had close ties to Yale through her family. Her mother was a Terry, another prominent New England family along with the Bartlett’s, and her mother’s cousin was the famous book collector Roderick T. Terry (1849-1933). The Dictionary of American Book Collectors says of Terry, “He became a member of the Grolier Club of New York and in that environment was able to enjoy the companionship of such avid collectors as Beverly Chew, William A. White, and John B. Thacher.” Henrietta Bartlett would serve as private librarian and cataloguer for both Chew and White. Biographical details about Henrietta Bartlett’s entry into the male dominated rare book world are scant, but it is likely Terry was involved in some fashion. Bartlett also had a close friendship with Ruth Granniss (1872-1954), the Grolier Club librarian who knew Beverly Chew well. Whatever the point of initiation, Bartlett flourished, first working closely with Chew as his private librarian, cataloging his library, while developing an expertise in Shakespeare and Elizabethan literature. Bartlett’s papers and correspondence are at Yale where in the 1920s and 1930s she gave lectures on bibliography, collecting, and rare books. Surprisingly, the archive appears to have been little used so far. The list of correspondents in the finding aid is extensive and shows that she was in contact with an incredible range of prominent collectors, dealers, bibliographers, and librarians. She was also involved with the Hroswitha Club, an informal Grolier Club for women when the Grolier Club was men only. Brief selections from the De Ricci letters to Bartlett soon to follow give hints at the potential riches available for study. Her most well-known publications include A Census of Shakespeare’s Plays in Quarto, 1594-1709 (1916, rev. ed. 1939, both with Alfred W. Pollard), Mr. William Shakespeare: Original and Early Editions of His Quartos and Folios, His Source Books and Those Containing Contemporary Notices (1922), and Catalogue of Early English books, Chiefly of the Elizabethan Period. Collected by William Augustus White and Catalogued by Henrietta C. Bartlett (1926). As a side note, the 1916 Census may well be the first major bibliographic work with a woman’s name on the title-page. So, we have two heavyweights working on The Book Collector’s Guide aimed not at the layman as usually encountered but focused on the roaring market of the 1920s—an audience of experienced collectors and dealers on one hand and rare book librarians on the other who are encouraged to supplement their “desperately antiquated” Lowndes. Were the resultant trials and tribulations of publication ultimately a success? The answer, as much in life, is not so simple. Wolf & Fleming write in Rosenbach, “A golden collector of the golden age was Charles W. Clark [1871-1933], one of the two bibliophilic sons of the picturesque copper king and senator from Montana, William A. Clark. Needless to say, the war [WWI] had not lowered the price of copper. Both the boys—Willie [William A. Clark, Jr.] and Charlie, the latter five years older than Dr. Rosenbach—began buying books at about the same time. It was Charlie, with a taste for early English literature, who first became a habitué of the Doctor’s New York book room. He started off in that May of 1919 so redolent with fine books by acquiring two late seventeenth-century Shakespeare quartos, and followed up that acquisition with two better quartos, the Vernon copies of the 1619 Merry Wives at $2950 and the 1619 Henry V at $2350.” Wolf & Fleming record a number of other important transactions including one gone awry when a liquored up Clark, usually steady at the helm, over-indulged at a Rosenbach function by writing a check for a Gutenberg Bible then in stock. When the fogged cleared and price settled in Clark changed his mind and returned the book! 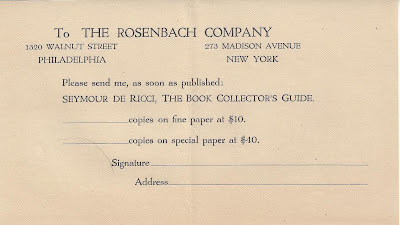 A June 15, 1921 publication date was optimistic and Rosenbach did indeed have to step in and take over publication with Clark’s “generous assistance.” The prospectus for the Guide says “Ready Christmas 1921” although the earliest presentation copies date from March 1922. It is telling of De Ricci’s frustration that he makes no acknowledgement of Kennerley in the book’s preface. 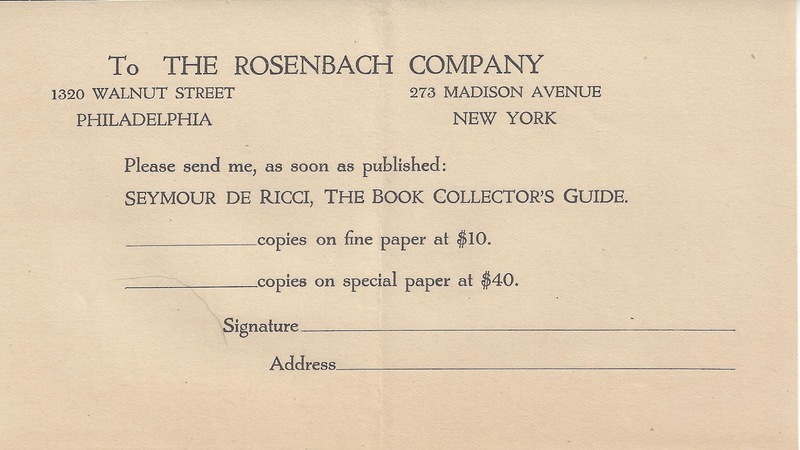 However, De Ricci does refer to an earlier possible publisher before Rosenbach. He writes, “I have received much invaluable assistance from the late George D. Smith, who had hoped to be able to publish this Guide and who gave me on innumerable occasions the benefit of his extensive knowledge of the American book-market.” Smith (1870-1920) held the mantle of the greatest American bookseller prior to his untimely death, after which Rosenbach assumed the title. 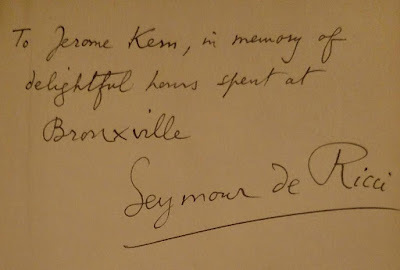 Had he lived, the book may well have been a George D. Smith imprint. The letters at Yale from De Ricci to Bartlett are filled with interesting book talk and gossip about the Britwell sale in London, various dealers, bibliographical matters, primarily Elizabethan, and mention of his wife and family. 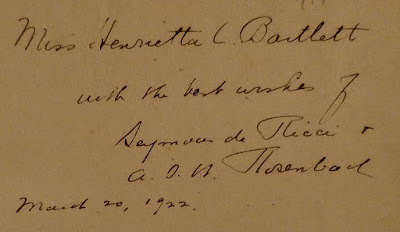 Bartlett spent time researching with De Ricci in London in the summer of 1920 and he appears to have visited her in America. Specific to the Guide, the letters reveal that Bartlett received one-third of the authors’ proceeds and De Ricci two-thirds. De Ricci called it “our” book when corresponding with her. So why did she not make the title-page as co-author as happened with her and Alfred Pollard with A Census of Shakespeare’s Plays in Quarto? It is a mystery unresolved. The correspondence makes no mention of the issue. 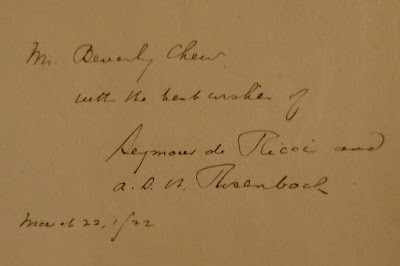 This “better than nothing “ was still quite a bit of money in the 1920s and the total author royalties mentioned by De Ricci would certainly have made many later bibliographers / biblio-writers envious. To have sold over 600 copies in the first few years at quite stiff prices also indicates the strong demand at the time for such a specialized title. One can conclude that from a sales standpoint the Guide was a solid if not spectacular success. Various association copies of the work gathered in my own collecting lend a tactile reality to the influence and interchange among the bookmen and women involved. And without these books my essay would never have come to fruition. 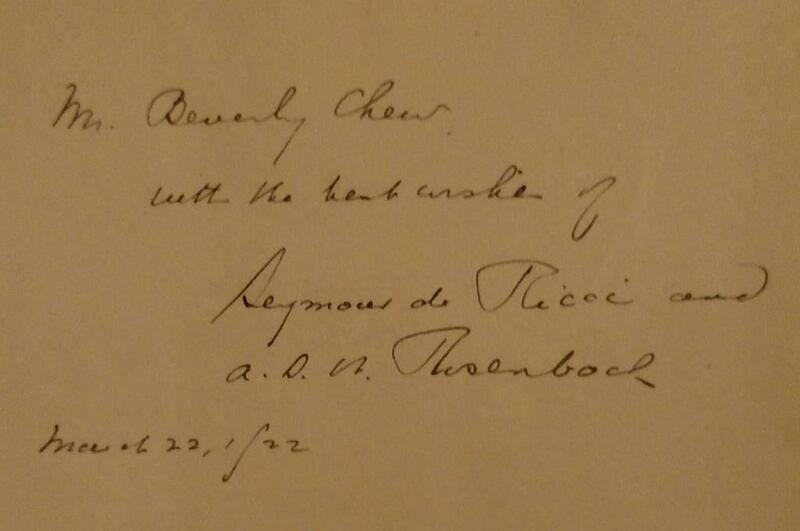 The co-author's copy, inscribed by Rosenbach from he and De Ricci. Japan paper issue. The prospectus pictured above is presented to Bartlett from De Ricci. Presented to Beverly Chew, Golden Age Collector, Henrietta Bartlett's patron, and contributor. Japan paper issue. Presented to Jerome Kern whose 1929 auction overseen by Kennerley peaked the Golden Age. Japan paper issue. Presented by Charles W. Clark, the dedicatee and underwriter of the book, to the Pacific-Union Club in San Francisco, a private social club established in 1889. Japan paper issue. 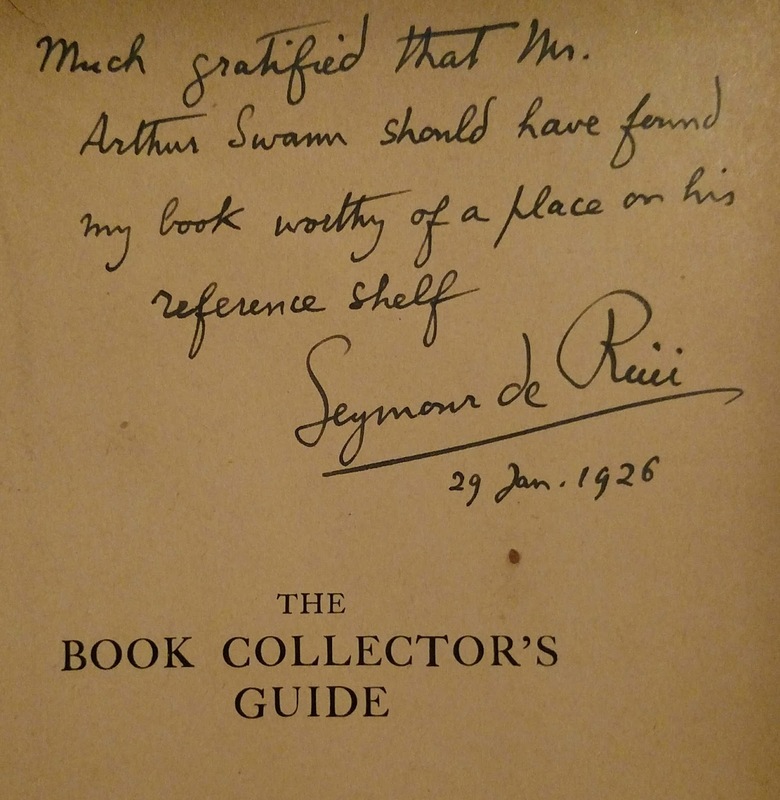 Inscribed to Arthur Swann, famed auctioneer and bookman. 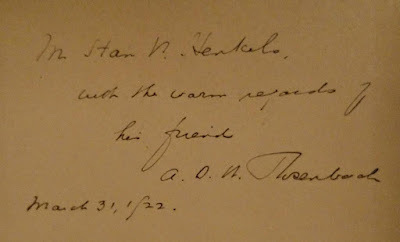 The date of the inscription coincides with a sale by Swann at the American Art Association of books from the library of William Andrews Clark. 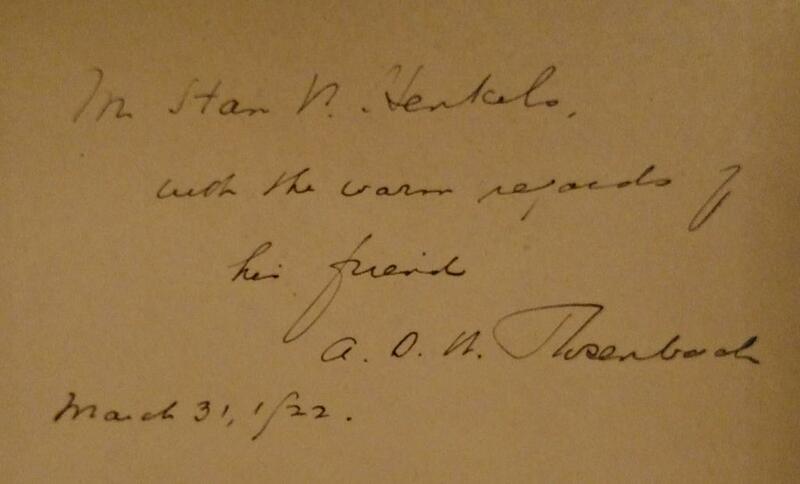 Inscribed by Rosenbach to Stan V. Henkels, legendary Philadelphia auctioneer and important mentor of Rosenbach.